The idea that the plays of William Shakespeare were written by someone other than William Shakespeare is a well-established motif in literary conspiracy theories. Starting in the mid-19th century, numerous and varied writers have gone into great detail to prove that the Shakespeare corpus was actually written by Francis Bacon, Christopher Marlowe, or Edward de Vere, amongst others. These theories are entertaining enough, partly because they convey that gratifying feeling of having discovered hidden knowledge, and partly because they shine light into the puzzling lacunae of Shakespeare’s biography. But they have never been particularly convincing. This leaves us with a situation where the known facts of Shakespeare’s life seem too paltry to tell us much about the writing of the plays, but the alternative candidates seem no more plausible. Consequently, we find a majority of scholars coalescing around the conventional attribution of the plays to Shakespeare (the Stratfordians) and smaller groups advocating for one or other of the alternative candidates (the anti-Stratfordians). In the absence of any greatly compelling evidence, positions on all sides tend to become rather fixed. In his new book, William Fortyhands, Samuel Crowell gives an erudite and entertaining history of the background to the Shakespeare controversy, weighs the merits of all sides, and offers his own, surprisingly plausible solution. Crowell characterises the literary milieu in which the plays were produced as the “Elizabethan Beats.” This description applies to the group of dissolute young men who congregated on the London theatrical world in the late 16th century, men like Christopher Marlowe. Like their 20th-century counterparts, these young writers embodied a “live fast, die young” ethos, and unlike the later beats mostly did die young. There were hundreds of plays being produced in England at this time and the Elizabethan Beats seem to have been an important engine of this industry. It is within this milieu that William Shakespeare left his legacy. Famously, following Shakespeare’s death a folio of plays bearing his name was published. 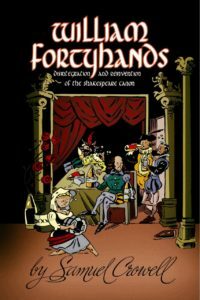 This has forever been the foundational document of Shakespeare studies but the situation is complicated because many of the plays had also appeared in quarto editions which were usually much shorter than the folio versions. Some of these quartos bore the name of Shakespeare but others were published anonymously. Even more confusingly, some of the individual plays were published in differing versions as quartos. Just to complete the confusion, earlier versions of the “Shakespeare” plays seem to have existed, written by other authors and upon which the Shakespeare versions seem to have been based, such as the Ur-Hamlet. Crowell marshals all of this material expertly and gives an excellent and lucid account of the rise of Shakespeare studies culminating in David Garrick’s 1769 Jubilee festival in Stratford. Ironically, the increase in Shakespeare’s popularity and growing interest in his life led to the uncovering of certain documents (most notoriously his will) that began to provoke questions about authorship. Crowell documents the history of the authorship question in great detail and is careful to contextualize his study with various theoretical perspectives, too much so in my opinion. But this does at least demonstrate his good faith in seeking to approach an objective view rather than promoting a personal hobby horse. Ultimately, Crowell concludes that the plays were probably written by a number of those Elizabethan Beats, either singly or collaboratively, and that a final position on who wrote exactly what is probably unknowable. The reason that Shakespeare’s name was so definitively associated with so many of the plays, Crowell argues, is that his role was something like editor and theatrical producer. Essentially, he sourced texts, edited them down for performance (the shorter quartos) and funded the whole enterprise. He would have been “informally presented” (p. 214) as the writer of the plays. Unlike the actual writers, Shakespeare appears to have been very wealthy at a time when playwrights were treated as cheap hacks. This is an elegant interpretation of the available evidence. Even though it leaves us with a situation vastly more complex than attribution to any one single author, it allows us to go beyond all of the evidential problems that such attributions caused. It is an excellent application of Occam’s Razor because Crowell follows the evidence and accepts what it tells him, even if doing so seems to shatter our idea of what it means to be an author. It would appear that in the 18th century the person who actually wrote the words of the plays was not much of a consideration. The “pull” would have been the name of the producer who would have been associated with a string of hits. It doesn’t take too much imagination to see the sort of contemporary parallels with this. For example, films are generally more closely identified with their directors than their screenwriters. Perhaps an even better example would be the mythical creator of Bitcoin, Satoshi Nakamoto . It is quite possible that Satoshi is a pseudonym hiding a number of cryptocurrency experts. Perhaps we should start calling him Satoshi Fortyhands? Despite Crowell’s compelling assessment of the evidence there are still questions remaining. Crowell points out that if Shakespeare really did write the plays then he must have amassed a great deal of knowledge from somewhere. It is pretty much agreed by everyone that he didn’t have an extensive education so perhaps he picked his knowledge up by socializing with a range of interesting and knowledgeable people? But if this mitigates against Shakespeare as a writer, which is primarily a solitary occupation, then surely it mitigates even more against Shakespeare as impresario, with all the organizational and publicity work that that would imply. Such questions are unlikely to resolve into definitive answers, and Crowell is surely right to conclude that we will never come to a definitive conclusion about who wrote Shakespeare’s plays. The scenario he paints in William Fortyhands is remarkable for being at once a sober handling of the evidence and a radical reassessment of the authorship question.